'Snowman in the Woods, Kilcooley Estate, Tipperary' The Genius of Van Der Putten in Co Tipperary. Superb Painting by Daniel Van der Putten. 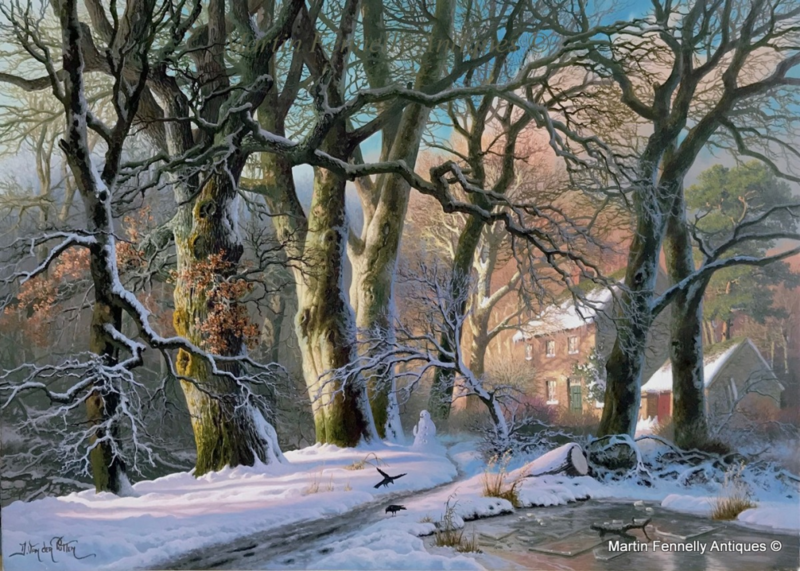 This is a beautiful Painting of one of Ireland's most beautiful Estates. The only (original) fully walled Estate in Ireland. In December 2010 the heavy Snow made for a winter wonderland. Daniel Van Der Putten is Dutch born but resides and paints in the UK. Exhibited only in the finest Galleries, it is a great honour to have a Van Der Putten in my Gallery and to have the only Painting of Kilcooley in Tipperary by Van Der Putten is a very rare honour. Van der Putten's majestic brush work captures with consummate finesse the Magic of this rural scene and his Shadow and Light work on the Snow is Superb.